Rummy Myths – All card games are driven by sheer luck. Fact – Many card games are a delightful combination of luck and sharp skills. Luck can drive your game for a given hand or a particular round but what matters, in the long run, is how skillfully you play your cards. Myth – Players have to deposit large amounts. 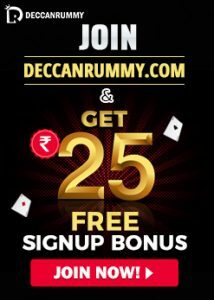 Fact – You can play Rummy online as DeccanRummy.com provides facility like the sign-up bonus for those who can’t afford higher deposits in their accounts. Myth – Online card games are just waste of time. Fact – Every month, hundreds of winners are announced on Deccan Rummy and various other online gaming sites who have won huge cash prizes. Obviously, that doesn’t sound like a waste of time! Does it? Players can interact with other people, can make friends online or can play with their buddies. It seems more a social activity rather than wastage of time. Myth – Prizes offered in online games are trivial. Fact – Those who think that prizes are trivial haven’t won the jackpots ever. At Deccan Rummy we offer an excellent opportunity to win huge cash prizes for our players! Myth – It’s unsafe to use your credit card online. Fact – Though it is true that you should avoid using your credit card for online payments if you are associated with a trustworthy brand or payment gateway like Deccan Rummy you don’t need to worry at all. Our gaming site is licensed and registered with the government authorities or is protected by government legislation (in the case of any dispute) are reliable as they often use security software to protect personal & financial details of customers. Fact –Rummy has been declared a game of skill according to the Supreme Court in India. Since it is not about gambling, it is legal in all parts of the country, even when cash is at stake. In many other countries, Rummy enjoys a legal status. Fact –The Rummy Rules has nothing to do with drinking rum or any other alcoholic beverage. A large number of people play Rummy online without having to drink any sort of alcoholic drink. Fact –There are many instances where people play rummy online and win money. In fact, with online rummy, one stands a chance to win cash every day. At DeccanRummy.com, you can participate in tournaments that offer a chance to win a large amount of money. The entry to some of these tournaments is free or a very small amount. If you are playing rummy online with real people (like you do at DeccanRummy.com), then there is always a fair chance of winning. Fact –This is the worst myth that is surrounding this wonderful game of online rummy. If you are a newbie, you can play with other amateur players to have an equal chance of winning. Moreover, you can play rummy online for free, till you gain a good grasp of the game. At Deccan Rummy, Free Tournaments are organized for newcomers, giving them an opportunity to win cash from the time they begin playing the game. Fact –Rummy dates back to the mid-nineteenth century. Some say that the game is derived from the Spanish game of Conquian, while others say Rummy originated from the Chinese tile game Mah-jong. There is also the theory that Rummy is a variation of Poker, which was popularized by the French. While there are several myths associated with Rummy, what is beyond debate is the entertainment and engagement this card game offers. Rummy has moved from clubs and tea stalls to the comfort of our homes, with the growing popularity of its Online Avatar. There will be a lot more myths coming up when the game becomes more popular and global. You can also read Some Cool Facts about Rummy if you want to know how, when and where this game was originated and took its route! Rummy is known to be the 3rd most popular card game across the globe. In the web world, it is the highest played card game. In the earlier days owning a deck of cards was something only the rich and elite could afford. With the popularity of Rummy card games nowadays, everyone can afford to buy a deck of cards. The cards that we use now to play card games have evolved to the current state after many modifications. They were initially handmade and each card was painstakingly painted. The evolution of paper and printing techniques is what has made the packs of cards so easily available. The origin of Rummy has been a disputed issue ever since it gained popularity. Some believe it originated from the Spanish card game, Conquian while others say Rummy came from a French variant of Poker. It is also believed that Rummy may have come from the Chinese game of Mahjong, played with tiles rather than cards. There are more than 20 variations of Rummy card games and more than a hundred local versions. ‘Rum’ is a common slang in the UK which means ‘odd’ or ‘peculiar’. When the card game was first introduced, it was associated with the slang ‘rum’ signifying that the game was unusual or odd. It is believed that Rummy was previously played for the alcoholic drink, Rum. The one who lost would need to buy the next round of drinks for the table. Rummy is not a gambling game and, therefore, it is legal in many countries due to the skill factor involved. Jack: If you take a closer look at the Jacks from each of the suits you will find that each has a subtly different hairdo. Only Jack of Spades and Jack of Hearts sport a mustache. Each holds something different in their hands. Their heads are turned at different angles. Queen: An interesting thing about the design of the cards is that the queen of diamonds is the only one among the four queen cards that have a slight smile.The Queen of Hearts has a melancholy look on her face, while the Queen of Spade and Queen of Clubs look a bit stern. All four carry flowers, but only the Queen of Spades has a scepter. King: If you look closely at the Kings you will find the king of spade and club hold swords, while the king of hearts and diamonds have a weapon behind their head.With the King of Diamonds, you will observe that he is holding an axe instead of a sword. The King of Diamonds is also the only one-eyed king and he is the only king without hands. All three Kings other than the King of Hearts have a mustache. The Aces: Have you ever closely examined the Ace of all suits? And of all the suits, the Ace of Spades is always designed differently from other suits. Its original design basically displays that tax on the manufacture of cards has been paid, and this tradition continues till date. Today, drinking rum or any other alcoholic drinks are not part of the rule set of rummy. Rummy is not the favorite game of the Pirates of the Caribbean. Rummy is not served in kegs. Bacardi did not invent rummy. Love playing rummy? Play it on Deccanrummy.com where hundreds of enthusiastic players play rummy online either for fun or to win real cash or both! 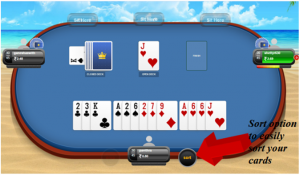 Also, visit the How to Play section if you want to learn to play online rummy. Don’t forget to post your comments and feedback! 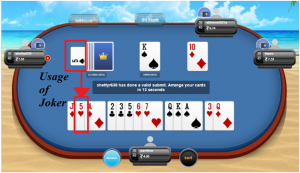 Wonder how to work out rummy strategies to play rummy online? 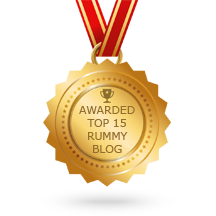 In this post, we are sharing few rummy tips and tricks that would help you learn the Indian rummy game and could be really useful in winning online games too. Check out the Rummy strategies below and learn to improve your winning chances and win more money! The first thing to do after receiving the cards is to arrange them as per suites i.e. spades, hearts, clubs, and diamonds so that you could easily differentiate between them. After arranging the cards by suits, another smart trick to follow is to sort the cards by color. The trick here is to separate red and black suits. This may sound a little weird but this Rummy trick of arranging cards in Red – Black – Red will help differentiate cards easily. The Sort button feature has been implemented by Deccan Rummy by which you can sort your cards with a click of a button. Rummy is a game in which you need skills to outplay your opponents. One such skill or rummy strategy while playing online rummy is to trick your opponent into thinking that you have a bad or good hand. Once your opponent is convinced, you can be sure of him either drop from the game or play until he discards cards that are useful to you. In Rummy, the winner is decided by points. The Rummy trick here is that while discarding cards, you should look to discard the cards with higher points first. According to the rummy rules, 10 and the picture cards (Jack, Queen, King, and Ace) hold ten points each and rest as per their number. Now, after sorting and arranging your cards, if you find that the useless cards that you have are any of these high point cards, you should aim to discard them first so that you don’t carry a lot of points if you lose the game. Though by discarding a higher point card will save you some points that don’t mean you discard a card that could be a Joker or a card that might be required by your opponent. If you discard a card in haste, chances are that you might commit a mistake and your opponent might pick and finish the game. #5 – What is the opponent playing on? There may be the situation where the opponent is picking every card that you are discarding and pretty soon the opponent finishes the game. This rummy trick cannot help you stop your opponent from finishing (which one cannot) but, at least, you can minimize the chances of your opponent of picking the card discarded by you. While playing rummy, one should keep a tight watch on the possible cards that the opponent might need. If you have a slight hint on the possible card that your opponent requires, you might refrain from discarding that card. For example, if you discarded queen of diamonds and your opponent picked it, chances are high that your opponent will also pick jack of diamonds so you should think thrice before discarding jack of diamonds even if you want to reduce your points. And if you discarded jack of diamonds just because you wanted to reduce the points, chances are that your opponent will pick that and finish the game. All you need is to remember what card your opponent earlier picked. In online rummy, if you don’t want a lot of point’s penalty, the most important tip or trick is to make one pure sequence as early as possible in the game. 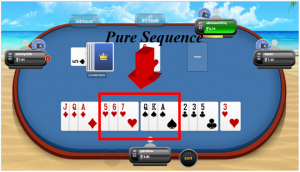 After you sort and arrange your cards, the first thing you should check is that whether you have a pure sequence or not. If not, then the first step should be to make a pure sequence first. If yes, you should now calculate the points that you would get if you lose the game at this stage. This number should form your strategy to play this game. If you make a pure sequence of three or four cards and the opponent declares, you will not get points for those three or four cards. This way you will save a lot of points. #7 – How to use a Joker? To play rummy online and win the game, one should understand that Joker plays an important role. If you have a pure sequence and a joker too, you should try to use that joker to make the second sequence by using that Joker and then calculate the points that you are getting. Also, the trick to using a Joker should also revolve around reducing the points so if you have a jack and queen of hearts vs. a three and four of clubs, you should use the joker with jack and queen of hearts so that you would get points only for three and four of clubs. This list doesn’t end here. Indian Rummy tricks and tips can be developed by each player. Following some of these tricks may help you play rummy online easily. It depends on the player to player on how they make their rummy strategy and play rummy online. In this card game of skill, you will not only have to play your cards but also have to read the mind of your opponents. Once you master these rummy skills and strategies, you can be sure of increasing your winning percentage by up to 75%. Learn these skills and play rummy online with lots of confidence. Players can refer rummy rules and how to play rummy tutorial in our site for a better understanding about the game. Happy playing! Welcome Players! DeccanRummy, an Indian online Rummy website has come out with a bang! A game that everyone loves, a game that tests your skills, a game which gives you total entertainment and is close to the Indian hearts.DeccanRummy – Your new way to enjoy Indian Rummy Online uninterrupted. It is not just another online game but has a high-end technology implemented which gives you an awesome gaming experience. Here is to the people who love using their skills in games, this is exclusively for you and all the Indians who love to play rummy online. Bored of playing with the computer? Now get real-time experience by playing with real players.Deccan Rummy provides you many options like Multi-Player Games, Tournaments, etc. The games are easy to manage and simple to play, so you just need to focus on enjoying online tournaments with other Indian rummy players. Well, Rummy is a simple game with simple strategies. By playing on DeccanRummy you assured to have infinite fun and ultimate enjoyment. The good news is you can enjoy playing it wherever you want. The great news is you can make money out of it! Yes, you heard us right. We are providing you a platform where you can earn money to make a profit out of the game. Incredible isn’t it? This is not the only way to earn the profit. We provide you many other means to earn the profit.Eager to know how?While you keep guessing let us take a look at the procedure for signing up. Register now to play online rummy and have a great gaming experience. Register with us for free by entering some basic information the first time you are signing up. Verify your email id and create your very own account. Log in to our DeccanRummy and start playing rummy with other Indian players. Our online rummy site is completely secured and fully encrypted to assure full comfort and credibility to all our players. Simply create an account and get Rs.25 Instant joining bonus! Refer a friend and grab the bonus! Oh yeah! We also provide you loyalty bonus! Play our Free tourneys and win real cash with zero risks. It’s absolutely free to participate! Report a genuine bug and get a BUG BONUS of Rs.25. So Hurry up! Start playing and let us know if you find any bugs. 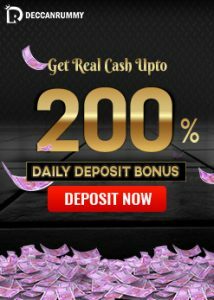 Get great deals on your first deposit and subsequently reloads. Reserved for our “best players”. Get access to special tourneys, unique offers as a high roller. STAY TUNED!!! Unbelievable virtual gaming which makes your playing realistic. A variety of Themes/Backgrounds for the game which adds a “WOW” factor. Realistic and sensible sound emission during playing games. Separate window to play for user’s convenience. User-friendly UI for a fast and smooth gaming experience. The player is given the convenience of chatting with other players. The player will be kept updated about the new features via News Alert. Variety in Games like Pool Rummy, Deals Rummy and Points Rummy. World Class Security and Credibility. Fast and simple Payment process.